Vivenda Summertime is a large, comfortable villa, with six air conditioned bedrooms, all with en suite bath or shower. Four bedrooms have 2 single beds, that can be converted into a king size bed. The other two bedrooms have three singles in each, these can be two doubles and a single, or four singles in one,and a double or two singles in the other. Vivenda Summertime is a large, comfortable villa; all bedrooms have on-suite bathrooms and air-conditioning. Huge fully equipped kitchen includes large fridges, oven, gas hob, dish washer, microwave, juicer, toaster, etc. Laundry room with washing machine. First floor open plan living room with very large corner sofa and chairs, fireplace, Sat TV, DVD, HiFi, extensive books. Wooden dining table seats twelve, many pictures, great ambiance. Outside dining terrace with large marble table and chairs to seat 14. Pool 6x11 metres (solar heating) + toddler pool, large terrace with twelve sun beds, tables, chairs, and BBQ. Full size tennis court tropical garden with fish pond, summer house with hammock + chairs, table tennis, pool table. Tennis Facilities: The tennis court is a modern all weather hard court. Step out of your room and stroll onto the court. No booking, no hot car journeys, no hassle. Dinner and Lunch Parties: Dinner at the villa can be provided by us. Forget the hassle of trying to find a restaurant table for twelve, eat better food for less at one of our fantastic dinner parties. We do the shopping, prepare, cook and serve a scrumptious three course dinner, and then clear up and leave you with a clean kitchen afterwards. Nobody gets the short straw with driving, the children won't get bored, and you won't be made to feel it's time to leave, when the staff want to go to bed! How about a fabulous Paella, Salad and Sangria lunch. All prepared and cooked for you and served either poolside or on the dining terrace. And, if you would like to go out for dinner and leave the little ones behind, for the evening, then we can make them a light supper and baby sit for the evening. All bathrooms have been renewed in the last few years. The two largest have large stone tops with double wash basins, three have coloured granite tops with single basins, and one has a pedestal type wash basin. Two bathrooms have baths with showers over the bath, three have walk-in rain showers and one has a shower cubicle. All bathroom come with hygienic tins for tissue disposal. All rooms have radiators, heated by means of solar panels / heat pump. Plenty dishes, utensils and kitchenware available for 14 guests. Inside dining table seats 12, outside dining table seats 14. Several golf courts nearby. Electric golf trolleys available for rent. Living room is on the 1st floor, no elevator available. The largest two bedrooms have three single beds each. These can be configured to king size doubles plus a single if required. We can also arrange four singles (dorm style) in one room leaving two singles or a king size for the other. Five of the bedrooms are on the ground floor. Three have doors to the pool terrace, and two on to the garden. The sixth bedroom is on the first floor, and has its own private balcony with great views. The kitchen and main living/dining area is upstairs, and the upper dining terrace looks over the pool and tennis court, which is great for keeping an eye on the children whilst enjoying a drink on the terrace. In addition to the internal marble stairs, there is a spiral stair case from the pool terrace up to the first floor dining area. The pool is heated by large solar panels. These generally maintain a water temperature 5C above a pool without any heating facilities. They do however require sunshine to be effective. All bedrooms have air conditioning. Four couples stayed a week at the beautiful Vivenda Summertime and had a great time. Rudi and Kathleen were very warm hosts and made our week very pleasant. We were able to walk to restaurants and the beaches and enjoyed the pool and tennis court. We would highly recommend this property! A wonderful property, spotlessly clean with lovely big bedrooms and en suites. 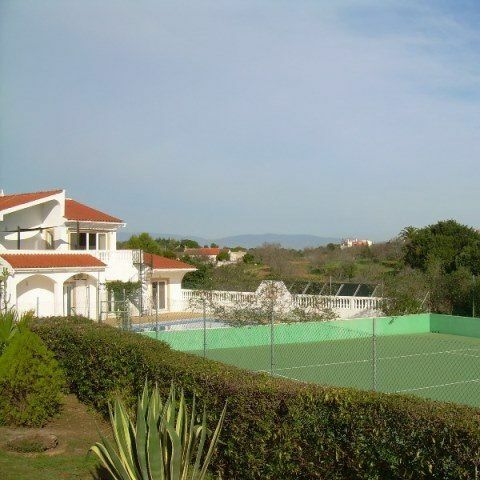 The pool and tennis court are great additions and make for a lovely holiday. The house is “upside down” with all the bedrooms on the ground floor which is a bit odd as when you are lying by the pool you have to walk through someone’s bedroom to go upstairs to the kitchen - or you take the winding metal outdoor staircase which is not suitable for anyone with mobility issues. We had a fantastic time - our only complaint was that of the 30 or so tennis racquets available, all of them were completely broken, so make sure you bring your own!! Lovely villa in nice location. Overall, this villa was great for our family of twelve (ages two to 86!). The pool was lovely and the tennis court was fun. The two gardens were great for a treasure hunt for the kids! All bedrooms have ensuite, which was particularly useful, and there was more than enough crockery and glassware. Rudi and Kathleen were on hand if we had any questions, or needed anything. Just a few small points that would have made this five star. Our party included a couple of very keen pool players, so it was a disappointment that the pool table was so rickety and uneven, it was unusable. Also the table tennis bats could do with renewing, as they were all falling apart. If you have very young children, some sort of stair gate would have been helpful, although I'm not sure how one could be fitted. I'm sure that if you love the Algarve and you have a large family, you will love this villa. Lovely traditional property with excellent additional facilities for everyone. Good location - just a short drive from the village centre. Traditional property in a quite location but close enough to shops and supermarket. Excellent facilities and a lovely clean pool area. Would highly recommmend to family groups. Definitely one of the best villas we have stayed at on the Algarve. Golf: There are ten golf courses within a fifteen minute drive, including; Penina (three courses), Pinta, Gramacho, Alvor, Palmares, Salgados. We can organise your golf for you and book with discounts on most courses. Ski: No snow again this year ! Air conditioning is chargeable for summer rentals. Typically air con use is +/- 10 EUR per day for the whole villa. A/C electricity is metered and charged at the standard EDP rate. Heating charge not included for low season rentals. The central heating boiler runs on solar panels and a heat pump. Depending the hours of sunshine, the charge will be between 8 to 12 EUR per day..